Optional Indexing attachment coming soon. 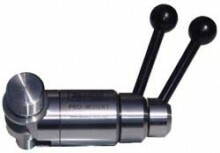 The ideal tool for holding turned work, while still in the chuck, for embellishing (carving, piercing, inlaying etc. ), with the ability to return it to the lathe for finishing without the need to re-centre. Click the button below to add the PRO-MOUNT DETAILING STAND to your wish list.